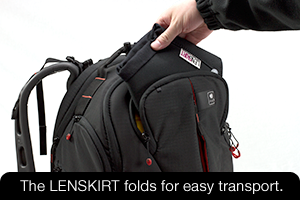 The LENSKIRT is a portable, flexible hood which you attach to the end of your camera lens. It allows you to shoot pictures / video through glass without internal environmental reflections such as yourself, room lights, camera flashes, light leak from under a door, etc. Because I was tired of my time lapse shots being ruined by someone flipping on a light, opening a door, or throwing a road flare into the room. Reflection on the glass makes it obvious that you were simply 30 stories up in a hotel room and not magically hovering above the Las Vegas strip taking mind blowing shots. The LENSKIRT blocks those pesky reflections and brings the magic back! Anywhere you can stick a suction cup. If you need to shoot photos / video through glass, use the LENSKIRT. Great for planes, trains, automobiles, hotels, offices, homes, aquariums, spaceships and submarines. It also doubles as a stylish hat. Simply attach the four corners of the LENSKIRT to a clean glass surface via the heavy duty suction cups. Setup your camera and insert the lens through the flexible opening. Tighten the enclosure and you are ready to shoot. Right here. Just use a clicky device and follow the link through the interwebs to place your order online. It’s easy, secure, and fun for the whole family.